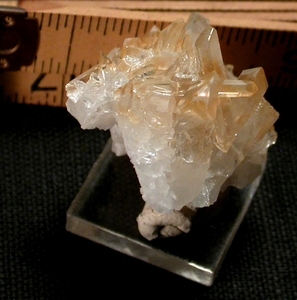 A splendid 1x 1" doubly-terminated cross formation highlights this Arkansas golden healer quartz cluster. Behind it rests a 3/16x 3/4" curved, doubly-terminated tabular crystal - also quite rare. Wafer-thin tabular crystals, needle crystals, rainbows, and a V-shaped startlingly white drusy base all invite your study despite a few missing terminations. Overall 1-1/2x 2-1/4x 1-3/6" high. Collier Creek Mines.